Gran Canaria is a relatively small island, 50 km from north to south and from east to west, and with a height of 2000 meters, but with many possibilities for leisure and enjoyment of the millions of visitors who enjoy both the nature as of our beaches. There are several possibilities we have for you to enjoy your visit to Gran Canaria. South Route. Tourist area par excellence of Gran Canaria, essential visit to the viewpoints of the Dunes of Maspalomas, Meloneras Lighthouse and the fishing village of the People of Mogán, at lunchtime, we can go to the ravine of Guayadaque and eat in some natural caves in very charming and with a local cuisine very appreciated. Being a medical laboratory, it could be very interesting to visit an Aloe Vera farm, where they teach us their cultivation and the process of making this magic plant. *Everyone knows the benefits of the South of Gran Canaria for water activities, there are many possibilities, excursions for the sighting of cetaceans, visits to virgin beaches in the West Zone of Gran Canaria, in the Guigui Natural Park, etc. ..
Route Center: The heart of the Island, impresses its summit, its ravines, its viewpoints and of course, the villages with more charm and more local flavor. Far away from the hustle and bustle of tourist areas and the city, we can visit cheese shops, wineries. You can propose a small trek of 60-90 minutes to the base of Roque Nublo, a volcanic monolith 80 meters high and from where you can see the best views of the island. There are many options for eating at the summits of Gran Canaria. 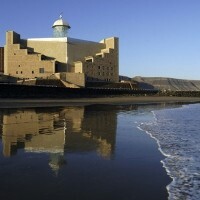 City of Las Palmas de Gran Canaria: A dynamic, fresh city with many leisure and cultural possibilities. The obligatory visits are the Colón Museum, the Triana Commercial Zone, the Alfredo Kraus Auditorium, the Las Canteras Beach and the different viewpoints of the city (Altavista and Las Coloradas) as well as the visit to the Pico de Bandama, where you can enjoy the best views of the city and the Crater of Bandama, which was the last active volcano on the island (2000 years), in this area we can visit wine cellars since it is the most important wine area on the island. There are many options to eat both in the Capital and in the Bandama area. *In recent years, the city offers many leisure activities in the beach of Las Canteras, surfing, snorkeling, paddle surfing etc., in case you saw it interesting, you can perform these activities. Do not hesitate to contact me for any clarification.